The best parts of summertime on Vancouver Island have gained some unique descriptors in recent years. For the second year in a row, Mount Washington Alpine Resort has extended its ski and snowboard season into what it has affectionately dubbed “Snowmer“. Record-setting snowfall over the 2010/2011 season has allowed the resort to open for summertime riding this June. Because more than 19 metres fell over the course of this season, the slopes are still rocking a 4-metre base at mid-mountain. Skiers and boarders can take advantage of the epic snowfall when the chairlifts start running on June 18th and 19th between 11:00 a.m. and 4:00 p.m. Lift tickets will set you back just $25. 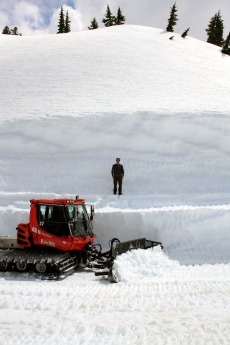 While Mount Washington still plans to open for summer operations on July 1st, the snowpack has caused the bike park and downhill mountain biking dates to be pushed back to July 15th. The mountain is hosting a handful of stellar events over the summer, so stay tuned for more information.